Soil Stabilization of 1,200 Cubic Yards (CY) of impacted soil by Jet Grouting Method. 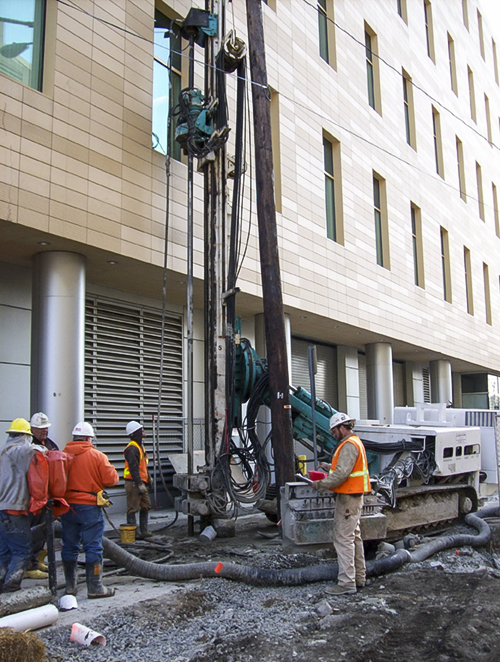 Utility Location and pre-excavation by vacuum drilling method. Continuous real-time movement monitoring of major utilities and adjacent structures. 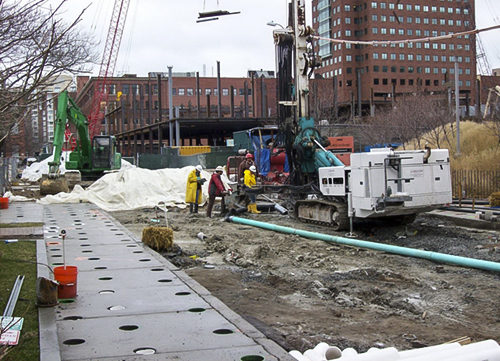 Geo-Solutions was contracted to stabilize approximately 1,200 cubic yards (CY) of MGP impacted soils underlying Linskey Way in Cambridge, Massachusetts by the jet grouting method. The impacted soils were the result of a residual contamination plume left over from the MGP site that occupied the parcel from the mid 1800’s. The plume could not be stabilized during the remediation of the main site because of the number of major utilities beneath Linskey Way. The majority of the former MGP site was remediated by Geo-Solutions in 2000 using large-diameter-auger soil mixing. The project received several awards and Geo-Solutions is proud to be a member of the winning team for the Region 1, 2006 Phoenix Award and the 2006 “Grand” Phoenix Award for the Kendall Square Redevelopment Project in Cambridge, Massachusetts. Geo-Solutions selected jet grouting as the method of stabilization due to the number of buried utilizes and potential obstructions beneath the site. Jet grouting uses the injection of grout at ultra-high (3,000 to 5,000 psi) pressures to effectively cut and mix the soil, thereby creating soil-mix columns. Columns are spaced to create 100% treatment of the affected area and result in a soil-mix “monolith” solidifying and stabilizing the soil and contaminants within. 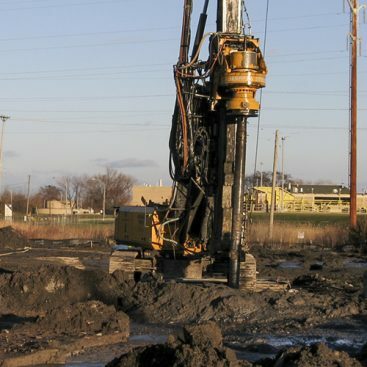 Due to the numerous sensitive utilities within the treatment area, jet grout column locations were drilled with non-destructive vacuum method and cased to safely bypass the utilities located in the upper six-feet of the treatment area. A total-station-based movement monitoring system was implemented by Geo-Solutions to monitor and protect utilities and adjacent structures. Health and safety real-time air monitoring was performed for the safety of Geo-Solutions workers as well as the general public. Vapor handling equipment with carbon treatment was utilized to minimize odors from the grouting operation. Geo-Solutions completed a 2-phase test program to establish jet grouting parameters, and column spacing and verify the reagent addition rates will meet the project solidification goals. Completed test-column locations were cored to verify effective column diameter, and sampled and subjected to centrifuge testing to verify that the cement addition was sufficient to immobilize contaminants within the soil-cement matrix. Utilities – Numerous, highly sensitive, subsurface utilities including an antiquated, but active 36-inch natural gas main, 18-inch high pressure natural gas force main, 6-inch water line, electrical duct bank, storm sewer lines, and overhead power lines . Public Protection – The site is located in a very congested, high-traffic area. Site is in the heart of Kendall Square in downtown Cambridge Massachusetts bordered by business offices, parking garages, and a public skating rink. Project Coordination – There were numerous entities involved in the project including Public Utilities, City Departments, adjacent building owners, multiple oversight engineers and other contractors. Permitting and coordination of all interests involved has been paramount throughout the course of the project. Site Logistics – Maintaining a full-scale jet grouting operation including batch plant, cement/bentonite deliveries, jet grouting rig, vacuum pre-drilling, and spoils solidification and handling, on a 7500 square foot parcel with as little impact to the public’s day-to-day activities as possible proved to be a major challenge. Geo-Solutions installed approximately 680 columns to complete the stabilization of the contaminated soil under Linskey Way. Treatment area was approximately 7,200 square feet. Columns were approximately 18 feet deep and were grouted from the top of clay later at approximately 18 feet to 13 feet below ground surface. 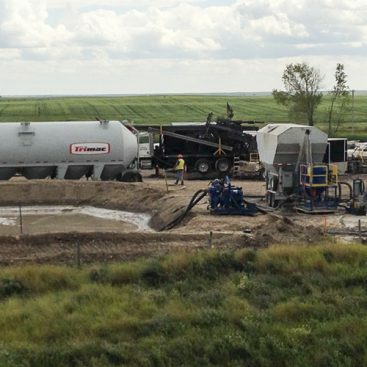 Geo-Solutions used a cement-bentonite grout mix to complete the jet grouting. Grouting was completed using Geo-Solutions’ C-7 jet grout rig and jet pump.